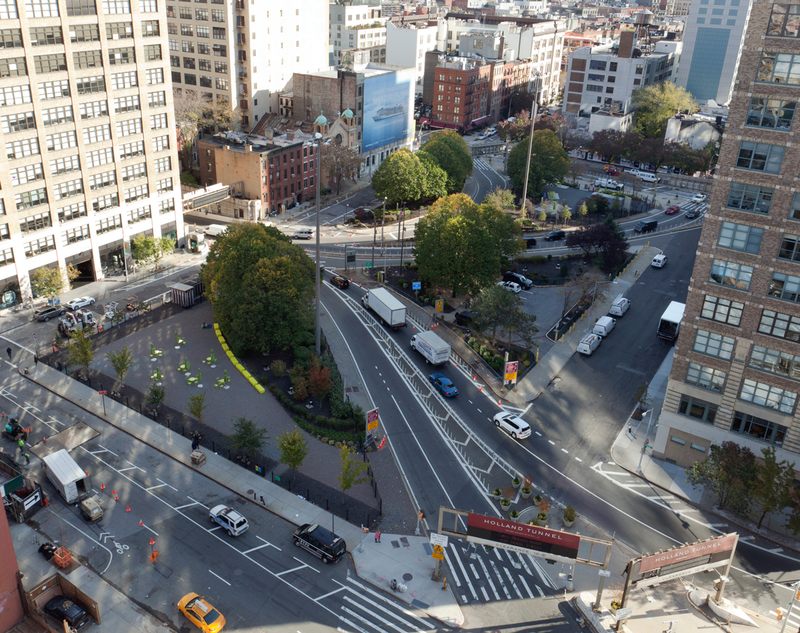 Hugging the looped entrance to the Holland Tunnel on Broome Street, Freeman Plaza West is a “found” public space in Manhattan that’s been reimagined as a peaceful parkland for area workers to remove themselves from the car-ridden bustle of the surrounding streetscape. The two-acre green space is the talk of the surrounding Hudson Square, and not just because its the newest non-desk place to eat lunch in the post-industrial Manhattan neighborhood. The project was conceived by the Hudson Square Business Improvement District (BID) and designed by Mathews Nielsen Landscape Architects (MNLA). Freeman Plaza is spread out over three adjacent landscapes—a west, east, and north plaza (the former two are finished). The spaces feature simple interventions such as tables, chairs, decking, solar-powered charging stations, turf lawn, book lending kiosks, public art, and programming, all input gradually over a period of several years. Over 40,000 people work in Hudson Square. The majority of them, due to the types of companies the area attracts, are young, mobile workers under 35 who are tech-savvy, transient, and seek time away from the office during the day. Freeman Plaza, Nielsen said, isn’t in a typical location for a park, but it offers the same respite a park might, while being somewhat of a shock to the local population—simply because it’s an actual green space with already mature trees in a non-green area. Freeman Plaza is the third “found” space in Hudson Square, identified as part of an initiative to amplify public space and rebrand the district. Hudson Square BID and MNLA released an award-winning masterplan in 2012 called “Hudson Square is Now” that gave way to a more sustainable streetscape with 250 newly-planted or retrofitted trees and a stormwater management system. Nielsen sees this type of casual, gradual landscape design as a way to help beautify and reclaim urban spaces in any city, especially areas that are walkable but also dependent on cars. She notes that observing the city with an eagle eye is key when siting underutilized areas located directly off of major pieces of transportation infrastructure. Freeman Plaza West opened to the public earlier this spring, following the initial build-out of Freeman Plaza East in 2014. MNLA’s design for the new Spring Street Park, located one block from Freeman Plaza, unofficially opened to the public last month.